Viewing PC media on your TV can be a pain, but Western Digital's WDTV, in effect, adds a USB2 input to your TV, so you can stream media from any USB device directly to the screen. WDTV is a small plastic box with two USB2 inputs, and HDMI, phono AV and optical digital audio outputs. It's powered by its own external supply, and is connected to your TV via HDMI or AV. 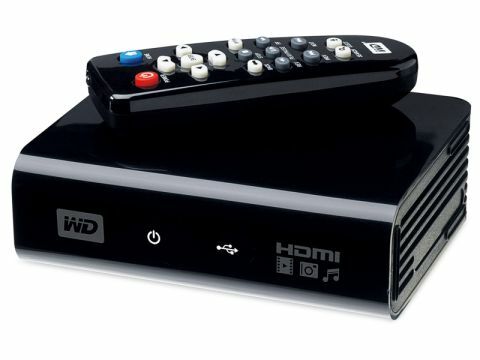 Connect any USB device (such as WD's My Passport portable drive or My Book desktop drive, a memory stick or a iPod), and WDTV recognises it and displays its content on a PlayStation 3-style GUI. Files are categorised as Video, Pictures, and Music, and can be sorted into various folders. Navigate to the desired file using the WDTV's supplied infra-red remote control handset, press PLAY, and your videos, music and pictures appear on your TV. You could get a fancier option (with a built-in hard drive, for example), but this is a simple, effective and economical way to show your digital media on your TV. It's very simple to use – the basic but comprehensive setup menu determines screen ratio, output type and so on. Though display quality is of course dependent on the source material, WDTV can handle up to 1080i video and doesn't seem to degrade the image at all. To help you to get media into digital formats, a disc of PC software including ArcSoft Media Converter is provided. Although you get phono cables, there's no HDMI provided. We're clutching at straws here…!